If you had to choose a single word to describe Joshua Tree National Park, surreal comes the closest to capturing the sheer weirdness of this desert area less than three hours from Los Angeles. Enormous stacks of boulders and the twisting, sculptural forms of the park’s namesake trees (actually giant agaves) create a landscape like nothing else on Earth. This surprising park has a way of changing perceptions of just what a desert can be and draws an eclectic group of visitors, from rock climbers eager to test their skills on Joshua Tree’s famous formations to seekers of silence and solitude. Spreading across 1,234 square miles (nearly 800,000 acres), Joshua Tree is the eighth largest national park in the Lower 48. The park takes in six separate mountain systems and portions of two different deserts, the Mojave and the Colorado, as it ranges from 900 to more than 5,000 feet in altitude. 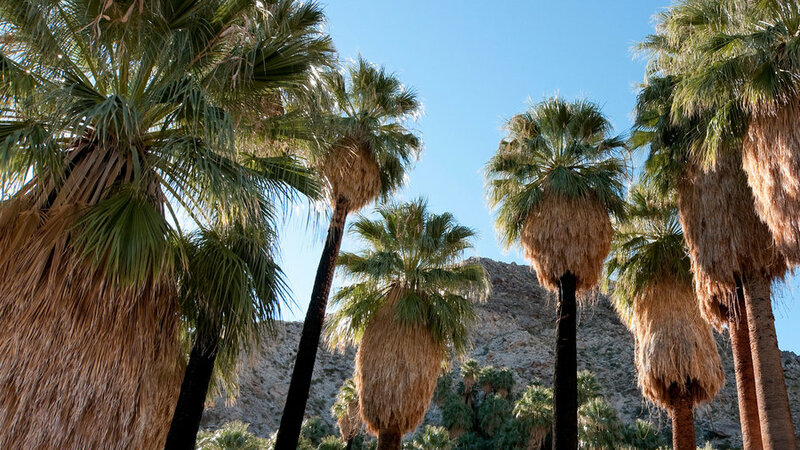 Variations in elevation and terrain, from sand dunes to craggy mountain peaks, mean that Joshua Tree is a surprisingly diverse place with more than 750 plant species, including California fan palms, numerous cacti, and cottonwoods. Joshua Tree averages only 4.06 inches of rain annually at an elevation of 1,960 feet (higher areas receive more). But given enough rain at the right of year, plus a little bit of heat to get everything going, the park’s annuals and perennials can put on memorable wildflower displays that draw people from all over the world from February into spring. Plants in the park’s mountainous sections may even bloom in June. While there’s considerable variation in the park’s geology, Joshua Tree is most famous for its monzogranite outcroppings. The monzongranite formed below the surface as molten material rose from within the Earth then cooled into solid rock with a system of vertical and horizontal joints. The mass began to slowly fracture along these joints into smaller sections and eventually, as erosion washed or blew away the surrounding material, the now-broken rock was exposed at the surface. These boulders have helped make Joshua Tree one of the world’s premier rock climbing destinations. Joshua Tree’s human history ranges from ancient Indian cultures to modern rock n’ rollers. About 10,000 years ago, the park was cooler and wetter than it is today, with grasslands that supported large herbivores such as mammoths, mastodons, and bison. The earliest evidence of human occupation comes from the many projectile points, some possibly 8,000 years old, found in the park’s Pinto Basin area and that were used on wooden spears to hunt the large game. Later tribal groups, including the Cahuilla, Chemehuevi, and Serrano peoples, continued to hunt but game populations decreased as the area turned warmer and drier. Gathering played a larger role in their diets as these peoples took advantage of the desert’s ample food sources, including mesquite pods, pinyon nuts, and fruit from cactus. They established villages at locations with access to consistently available water, such as the Oasis of Mara near the park’s present-day entrance in Twentynine Palms, and today the park protects more than 500 scattered archaeological sites. The area was first surveyed in the 1850s, and by the 1870s cattlemen brought in their herds to graze on then-ample expanses of grasslands. Prospectors eventually established roughly 300 mines, including the Lost Horse Mine, where they extracted more than 10,000 ounces of gold and 16,000 ounces of silver during a nearly 40-year period that ended in 1931. Even as mining, ranching, and homesteading continued, in the 1920s a push began to establish a desert recreation destination near the growing city of Los Angeles and to protect the Joshua Tree area’s fragile ecosystems and distinctive landscapes. With the rise of the automobile, the desert was potentially a huge attraction but also faced new threats as visitors dug up cacti and even Joshua trees for home landscaping. After Death Valley National Monument was founded in 1933 and the park service established Saguaro National Monument in Tucson to protect Arizona’s iconic cactus, Hoyt and others sought to set aside a preserve for the Joshua tree, the Mojave Desert’s signature plant. There were lengthy battles over boundaries and land acquisition issues before compromises were reached. Finally in August 1936, President Franklin Roosevelt issued the proclamation that created Joshua Tree National Monument. After another prolonged battle, the California Desert Protection of 1994 elevated the monument to national park status. Joshua Tree is less than three hours from both Los Angeles and San Diego. The closest major airport with commercial flights is about an hour south in Palm Springs. The nearest entrances to the main part of the park are off State Highway 62 near the towns of Joshua Tree and Twentynine Palms. There’s also an entrance off Interstate 10 about 30 minutes southeast of Indio that leads to the park’s more remote southern section. With moderate temperatures and the prospect of wildflower displays, mid-winter into mid-spring is prime time at Joshua Tree. Daily highs are typically in the 70s and low 80s, with cool nights dropping to the 40s and 50s. Summer days are hot as average highs soar above 100 degrees in July, although occasional thunderstorms can cool things, while also potentially creating flash floods. Fall is also another excellent time to visit as daily highs drop into the 80s. Winter visitors, especially in December and January, are sometimes surprised by snow and freezing temperatures, especially at higher elevations. You’re here for the Joshua trees and boulders and you’ll see plenty on the drive to the easy loop hike at Hidden Valley, a good introduction to the park’s terrain. From Hidden Valley, continue out to 5,185-foot Keys View in the Little San Bernardino Mountains for a panorama that takes in a vast swath of the Coachella Valley, as well as sections of the San Andreas Fault, plus the snow-covered summits of 10,804-foot San Jacinto Peak and 11,502-foot San Gorgonio Mountain—Southern California’s highest point. Joshua Tree puts you within easy reach of several other major parks in the California desert. You can stop here as part of a desert grand tour that includes visits to Anza-Borrego Desert State Park (75 miles southwest in San Diego County), Mojave National Preserve (closest sections are 70 miles to the northeast), and Death Valley National Park (240 miles north). And if you’re looking for some creature comforts, the golf resorts, restaurants, and spas of Palm Springs are barely an hour away. Joshua Tree National Park; . Joshua Tree National Park Association; .